People from all over the world come to Lancaster Pennsylvania to purchase quilts made by Amish and Mennonite women. These Amish quilts with roots in many cultures are viewed today as quintessentially American. Most first time visitors are taken aback by the great variety of design and coloring, as well as the intricacy of quilts on display. Not so obvious is the special way these quilts are produced. At a time when practically every textile product sold in America is made in a sweatshop in Asia, these Amish quilts are made one at a time in people's American homes. What's more, these quilts are made using just the technology that was in common use 150 years ago. Because of the extensive handwork most women only take part in producing a couple of quilts each year. Within the Amish and Mennonite communities here, quilts have special significance. Quilts are made in these communities to mark marriages and births and therefore are made with love and special attention to detail. This same care and love can often be seen in the Amish quilts that are made for sale to outsiders. Amish Country Quilts has since 2001 been shipping the best of the quilts offered for sale here in Lancaster to wonderful customers across America and around the world. All the 'Amish quilts' offered for sale here share a common set of characteristics which collectively set them aside from quilts in general. The key characteristics for what we call Amish quilts begin with how they are intended to be used, and carries on with what goes into each quilt, and how and by whom they are made. Amish quilts, while beautiful and certainly works-of-art, are made with the intention that they will actually be used as bed coverings and baby quilts. With strong seams and colorfast fabrics they are made to be laundered. And so even with daily use and reasonable care they can easily become family heirlooms. Wall hanging size Amish quilts are made in the same way. Amish quilts are entirely hand quilted. The quilt top, batting, and quilt backing fabric are sandwiched together and held taut in a quilting frame. The quilter then uses needle and thread to place each quilting stitch in the quilt. A typical queen size bed quilt will have forty to fifty thousand such stitches. The quilting stitches are small (6 to 12 per inch), straight and uniform. To insure uniformity all the quilting for each quilt is done by one quilter. Variety of design is the rule for Amish quilts. While the quilts Amish make for use in their own homes employ classic geometric designs with solid color fabrics and a limited range of colors, the quilts that they make for others include the classic designs but also applique work, embroidery, and brightly colored printed fabrics. To facilitate hand quilting, colorfast quilting weight cotton fabrics (and occasionally light weight woolen fabrics) are used to cover the fronts and backs of Amish quilts. Fabrics are purchased off-the-shelf from fabric stores or distributors in small quantities usually no more than a bolt of a particular fabric at a time. Extra wide fabric is purchased to be used to cover the back of the quilt. It is traditional and not unusual to use somewhat rustic cotton muslin on quilt backs and, where appropriate, on the front of quilts. Both solid color fabrics and printed fabrics are used in Amish quilts. Since polyester batting became available sixty years ago it has been the batting material most always used in Amish quilts. Being much easier to quilt than raw cotton batting found in antique quilts and by making a quilt much easier to launder (wet cotton batting weighs 'a ton!') practical Amish women quickly made the switch. Excellent but more expensive woolen batting is also occasionally used in Amish quilts. Patchwork piecing of Amish quilts is usually done with a sewing machine. Connecting patchwork pieces together this way makes the quilt very strong. What's more, this stitching can not be seen once the quilt is completed. Amish women have used non-electric sewing machines since they first became available over 150 years ago. On the other hand, applique work is all done by hand, as is most embroidery and binding. Quilting is often thought of as communal activity such as a quilting bee where woman gather around a quilt frame to quilt a bed quilt. With Amish quilts today two, three or four people may work together to make a single quilt, but instead of quilting together each takes on a one or more of steps in the quilt making process. The first step in the process is to select the quilt's design and select and purchase the fabrics to be used in the quilt. Second step is to assemble the quilt top. Third step is to do the quilting and the fourth step is add the binding and ready the quilt for sale. It is not unusual for a different person to do each step. But the most common practice is for one person to do steps one, two and four and another person to the quilting. Occasionally a single person will do it all. The reason for the division of labor is that the work involved in each of the steps is quite different. The ability and artistic talent to select fabrics is not common --better for someone with this talent to apply it to the making of many quilts. Piecing a particular quilt top becomes easier and the workmanship better after quilter has made a half dozen tops of that design. So it is best to turn to a woman who is expert with a particular design to make the quilt top with that design. Quilting usually is not specialized to a particular design or style of quilt and is less cerebral -- in fact it may be a great distraction from the problems of the day. Applying the binding and readying the quilt for sale -- which means finding and removing spots, finding then adding missing lines of quilting, requires attention to detail. The coordination of the whole process is usually done by the person selecting the design and fabrics. This person selects Amish and Mennonite friends to work with on each quilt. Each person working on the quilt works on it in their own home. All work is done in America. The quality of an Amish quilt is dependent on persons making the quilt and their standards and attention to detail. Anyone who has made a quilt knows how many things can go wrong in making a quilt. But with the right experienced people working carefully, wonderful quilts can be made. The quilts shown here are made in that fashion. Amish Country Quilts is a marketplace not a quilt shop. Quilts listed here have been listed by the individuals responsible for them. 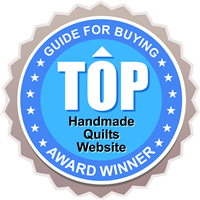 When you purchase a quilt you will be purchasing it from the person who listed it. That person will accept your payment and ship your quilt to you. Each of these individuals pay a small commission on each sale to Amish Country Quilts in return for being listed here. Amish Country Quilts is based in Lancaster, Pennsylvania, and is operated by Doug Stuart.